A second Banksy mural has been removed from a wall in Tottenham. 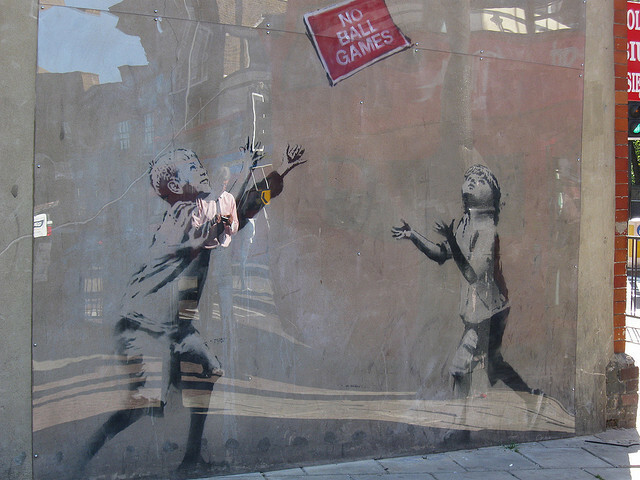 The artwork, called No Ball Games which shows two kids playing with a "no ball games" sign was cut out of the side of a shop yesterday, at the junction of Tottenham High Road and Philip Lane. The stencil dates from 2009. It's been taken by the same group who sold Banksy's Slave Labour, which was taken from a wall in Wood Green last February. The Sincura Group said it had not been appreciated in situ and would be sensitively restored and sold in 2014. Slave Labour went on to reach an estimated £750,000 at auction in June. Haringey Trades Council secretary Keith Flett said, "The Banksy was an important cultural feature of the area, and if it has been removed – which currently looks rather likely given the wall is being re-plastered – it will be another indication that local people’s wishes in the area come second to the interests of profit." Sincura Group released a statement saying the artwork had been "gifted" to local charity Step by Step, which works with disabled children and their families in Haringey.